We’d love your help. Let us know what’s wrong with this preview of Meadow Pause Revisited by Cornelia "Connie" DeDona. Musing on Life with all of its hot flashes, opinions and challenges. Reexamining the pain and finding peace joy and humor in the process. Take a look back and then flash forward to the present with this New York/ Hawaii transplanted baby boomer as she shares her highs, lows and everything in-between. To ask other readers questions about Meadow Pause Revisited, please sign up. Review copy won on Goodreads.com on 2-17-12. Sorry for delay, mail package just found in former neighbor's garage 5-12-12. 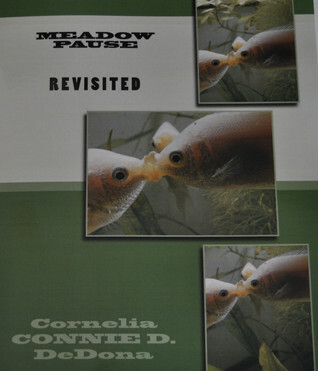 Cornelia Connie D. DeDona does a masterful work in Meadow Pause Revisited. The descriptive verses of sites around the Islands makes me long for a trip there! The Barber turned back time to when my father was a barber before long hair was "groovy." Whether describing the beauty and power of a volcano or islands of plastic garbage, the author paints a vivid picture and feeling w Review copy won on Goodreads.com on 2-17-12. Sorry for delay, mail package just found in former neighbor's garage 5-12-12. Whether describing the beauty and power of a volcano or islands of plastic garbage, the author paints a vivid picture and feeling with her words. The photographs included in this book further enhance the author's vision of her surroundings. I have never read any poetry quite like Cornelia's. Her sass and quirkiness bleeds through the lines in her book, Meadow Pause Revisited. Some of her poems don't make a bit of sense, but I found most of them to be very well-written (even if they are a tad abrasive). I won this book for free through Goodreads First Reads. I won this book on goodreads. This was an interesting book of poems and pictures. I usually don't read poetry books, but this was very enjoyable. Pretty book. A relaxing way to spend time over & over again. Will make you smile with your our memories of the past. Seeing the pictures makes me long for a Hawaiian retreat! Poetry and Photography. Take a wild ride slipping from sensitivity to brashness down the menopause slide and find your own peace, wisdom and inner joy in the process. "Connie is an elegant, perceptive poetess. Full of knowledge, she delivers with a rare beat of rhythmic angst, expressing for others the joy as well as the life we know Poetry and Photography. Take a wild ride slipping from sensitivity to brashness down the menopause slide and find your own peace, wisdom and inner joy in the process. Cornelia DeDona is the recognized author of Letters to a Prisoner by Connie D. She is a co-editor and the creator of one Anthology, Saturdays with Lillian. Published from 2008-2013 in Rain Bird, award-winning Literary and Art journal of Windward Community College, Kaneohe, Hawaii; in 2010 her poem, Writing Retreat received Rain Bird's, Kolekolea Honorable Mention and in 2013, she won Rain Bird's c Cornelia DeDona is the recognized author of Letters to a Prisoner by Connie D. She is a co-editor and the creator of one Anthology, Saturdays with Lillian. Published from 2008-2013 in Rain Bird, award-winning Literary and Art journal of Windward Community College, Kaneohe, Hawaii; in 2010 her poem, Writing Retreat received Rain Bird's, Kolekolea Honorable Mention and in 2013, she won Rain Bird's coveted Kolekolea for her poem Speaking French. www.authspot.com, www.herenow/7beats, www.postcardshorts, www.aarp.org/sixwordmemoirs, www.smithmag.net, www.bambooridge, www.hazardcat.blogspot, www.barrierislandsreview, www.OneFortyFiction.com. www.islandscene.com, June 2011 issue of Hawaii Fishing News for her poem, “The Great Pacific Garbage Patch” as well as the July 2nd, 2008 edition of the Honolulu Star-Bulletin for her poem: “Book Makeovers”, in honor of The Annual Book Sale sponsored by The Friends Of The Library. Chronogram December 2015 "Fine Wine" and March 2016 "We Plant Seeds". The Pen Woman April 2016 "We Plant Seeds". Cornelia created, facilitated and hosted poetry events for local television and YouTube at Habilitat, a drug rehab in Kaneohe. Cornelia is currently an Arts and Letters Member at Large of the National League of American Pen Women. In 2015, The National League Of American Pen Women awarded her third place in the multi-disciplinary category of the inaugural Vinnie Ream competition for her latest book, Hawaiian Time. “Are you aware that they inject all kinds of antibiotics into that meat you eat?